The Alyscamps—a Gallo-Roman cemetery near the edge of Arles—has been around for a very long time. Once one of the most-famous cemeteries in Europe, it was a place which attracted Vincent van Gogh who painted several scenes there. How did the cemetery come into being in the first place? People who lived in Roman cities were forbidden from burying their friends and loved ones within city limits. As a result, roads leading to/from towns were often lined with tombs and mausoleums. Beginning around 250 B.C., people in and around Arles (in today's France) used the final stretch of the Aurelian Way—which led to the city gates—as a burial site. The Alyscamps had a range of memorials, from very elaborate monuments to simple sarcophagi. St.Trophime, Arles’ first bishop, was buried there. More and more bodies were added over the years until, by the 4th Century, the place contained thousands of human remains. Then, after1500 years (or so) had passed, the Alyscamps began to fall into disrepair. In the 12th century, after St. Trophime’s body was transferred elsewhere (to St. Etienne), the cemetery which was once sought-after as a final resting place for wealthy Europeans, lost its status. During the Renaissance, people pillaged the cemetery as they searched for building materials they could use for their own homes and shops. 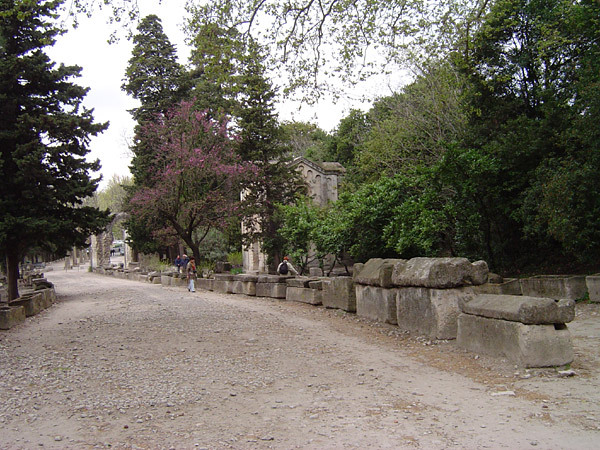 Little is left today except for a wide, tree-lined alley which leads to the remains of the St. Honorat church. Tombs are still located on either side of the lane. When Vincent painted here, he was not always alone. With him, in the fall of 1888, was Paul Gauguin. Vincent painted what he saw, while Gauguin merely used the scene as a springboard for his imagination. He encouraged van Gogh to use the same technique. I think that you’d like the leaf-fall that I’ve done. It’s lilac poplar trunks cut by the frame where the leaves begin. These tree-trunks, like pillars, line an avenue where old Roman tombs colored lilac-blue are lined up to right and left. Now the ground is covered as if by a carpet with a thick layer of orange and yellow leaves fallen. Some are still falling, like snowflakes. And in the avenue dark figurines of lovers. The top of the painting is a very green meadow and no sky, or almost none. Vincent created another pair of oils-on-canvas, entitled “Les Alyscamps” or “Elysian Fields.” One of those works, "L'Allee Des Alyscamps," which is privately held and also known as “Avenue in Arles” or “Lovers’ Lane” scene, sold on May 5, 2015 for the sum of $66.3 million. Vincent originally gave that painting to Marie and Joseph Ginoux, a couple from Arles who became the artist’s friends. Madame Ginoux owned the Café de la Gare, in Arles, where Vincent lived between May and September of 1888. An image of the original work—which measures 36.2 x 28.9 inches (92 x 73.5 cm)—is at the top of this page. Click on it for a great view. Bos, Carole "Vincent van Gogh and His $66.3 Million Painting" AwesomeStories.com. May 06, 2015. Apr 20, 2019. Vincent van Gogh - "L'Allee Des Alyscamps"